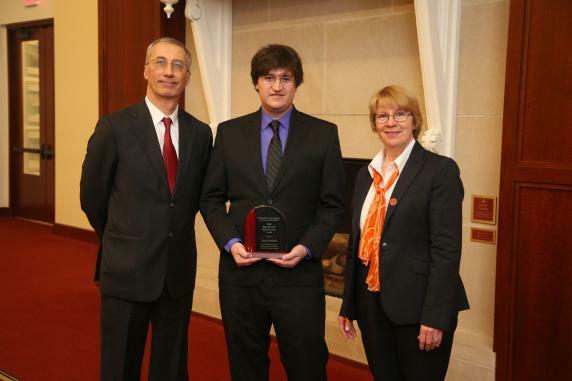 Ames, Iowa—Iowa State University's Department of Computer Science honored Sean R. Stanek with the Department of Computer Science Young Alumni Award at an honors and awards ceremony on October 25, 2018 in Ames, Iowa. The award recognizes outstanding early career alumni from the Department of Computer Science in the College of Liberal Arts and Sciences at Iowa State. Stanek’s passion for computers began in early childhood, and his desire to understand how they worked drove him to learn to program at a young age. Before entering college, he had already worked on hundreds of programming projects, taught hundreds of students online, and authored several assembly language, machine learning and computer hardware articles. He earned many awards, and was selected to participate in the Intel International Science and Engineering Fair with a project that performed a scientific comparison of optimized C code against optimized assembly code across different aspects of 3D graphics engines. During college, Stanek twice competed as part of a university team that advanced to the ACM International Collegiate Programming Competition, held internships with AMD and Microsoft, helped architect a real-time medical video analysis software system for EndoMetric, and received a Research Excellence Award from the university while earning his Ph.D.
Stanek is employed as a Principal Software/Reverse Engineer at Twitch, a division of Amazon, where he received the Amazon Inventor Award in 2017. Prior to his current position, Stanek worked as a Reverse Engineer with Curse, Inc., working on dozens of projects, attracting the attention of Twitch and Amazon, which acquired the company in 2016. Stanek received his B.S. degree in computer science from Iowa State University, where he continued his education, going on to earn his M.S. and Ph.D. degrees in computer science. The College of Liberal Arts and Sciences at Iowa State University is a world-class learning and research community. As Iowa State’s most academically diverse college, LAS educates students to become global citizens, providing rigorous academic programs in the sciences, humanities and social sciences within a supportive personalized learning environment. For more information, visit LAS.iastate.edu.